As the Mets came into Atlanta I couldn’t help but feel that there was a great chance for redemption. After losing 4 straight games to start the season, the Braves had managed to win 5 straight including an impressive sweep over the Brewers. This team looked completely different once they returned home and I was hoping for the winning streak to continue. With Hanson on the mound I didn’t see any reason to worry. And to be honest Tommy Hanson pitched a pretty darn good ball game. His entire outing was dictated unfortunately by one pitch. A curve ball that Ike Davis hit over the right field fence as Jason Heyward watched helplessly. Hanson was more or less cruising through the first 5 innings. The only run he allowed was in the 2nd inning where a poor pick off attempt to a not so great fielding 1st baseman Erik Hinske didn’t go as planned. This would allow the Mets to play small ball and push across a run. As we entered the 6th inning Hanson had a reasonable pitch count and had done a great job of limiting his base runners. I know you guys aren’t reading this for a full recap of the game as you could go to a 101 different websites and find that. You come here looking for an opinion and a different take on things. However I figured I’d include just a small prelude to my point. As we fast forward partially through the 6th inning we will find that the Mets have a runner on 3rd base with 2 outs. Tommy Hanson is still in the game and still looking relatively strong. I can honestly say that with 2 outs in the 6th inning he was still the guy that should be out. No need to lift him for the bullpen. David Wright comes up to the plate with the go ahead run at 3rd base. Fredi Gonzalez signals for the intentional walk. As Wright headed down to 1st base I couldn’t help but scratch my head in confusion. Now this isn’t intended to disrespect David Wright, not at all. I’m actually a very big David Wright fan as some of you know and I have a lot of respect for his abilities. And on the surface I see where Fredi was coming from because many Braves fans seemed to support the move. Wright is swinging a very hot bat and is the Mets best player, while Ike Davis has been ice cold. So you naturally would want to avoid Wright, correct? Not in my opinion. If I were Fredi Gonzalez I would have pitched to David Wright and taken my chances with whatever outcome was intended to come my way. Why? Because David Wright is 3-20 against Tommy Hanson all time. That accounts for a .150 career average. I don’t care if you are the Virgin Mary. If you are 3-20 against someone then you can’t hit them. That’s what the numbers say. Right? Hanson is obviously a right handed pitcher and Wright is obviously a right handed batter. Immediately that accounts for something in my opinion. If I’m going to intentionally walk a right handed batter to get to a left handed one when my pitcher is a righty then I’m going to need a lot of evidence to do so. Wright does not have the career numbers against Hanson to warrant that walk. Hanson was forced to face the left handed Ike Davis who is not a bad hitter and who possesses a fair amount of power. He doesn’t have an impressive average at the moment but you have to remember it’s the beginning of the season. He’s hit a lot of balls hard this year that could have easily been hits. After throwing 5 straight curve balls to Ike Davis, Hanson watches the last one fly over the right field fence. One swing later the game goes from a 1-1 tie to a 4-1 Mets lead. Of course at this point in the game that’s a decent size hole for the Braves to climb out of as their offense has shown signs of life but still hasn’t completely clicked. If Hanson faces Wright who he has outstanding numbers against and gets the 3rd out, the game is tied going into the bottom of the 6th inning. The Braves would likely need 1 or maybe 2 runs to win this game. O’Flaherty and Venters would dominate a Mets line up that is almost all left handers, making it nearly impossible for them to get any type of rally going. So I pose the question… What’s in the numbers? Did Fredi Gonzalez not do his homework on the Mets hitters? Did he know the numbers and ignore them? Should a game be managed by the numbers or by gut instinct. Yes, David Wright appeared to be the more intimidating batter but it was Ike Davis who ultimately burned the Braves. I’m normally not one for doing game recaps as you can probably tell. I figure that you guys get enough of that from ESPN and MLB Network. On the rare occasion that I do a game recap, I like to at least point out some of the less obvious occurrences. Last nights battle between the Braves and Giants felt like a playoff game. It was truly amazing the tension between the two teams who were playing a game in the middle of Aug, not the middle of October. Games as good as the one we saw last night deserve a closer look to see if we got any information that might give us an indication or two that one team has the edge. On one swing of the bat Freeman altered the Wild Card standings by 2 full games. This goes right back to the point I made in the previous article, head to head games are critical to your success when in a playoff race. At the end of each game the standings will be altered in one way or another, they can never stay the same as in the case of both teams getting a win when they are involved in two different series. When Freeman hit that ball up the middle scoring the game tying and game winning runs he gave the Braves a 5.0 game Wild Card lead. However let’s picture a different scenario. What if that ball had been a line drive to the 2nd basemen? The out is recorded and now the Giants are facing only a 3.0 game deficit in the Wild Card standings. Clutch hitting for Freeman did the Braves a lot of good in more ways then one. For some of us it seemed as if Hudson just didn’t have his best stuff last night and to be honest I agree. However it wasn’t quite as bad as it appeared. When Hudson took the mound in the 4th inning he must have been feeling pretty good about himself. He had been able to escape some early trouble and had put 3 zero’s on the board to start the game. The 4th inning would not be nearly as kind to Hudson. Let’s break it down. The 4th inning was where the Giants were able to tie the game without even recording a single hit. Hudson was not able to make them work for their runs, it was more of a hand out if you ask me. Bourn opened the inning with a huge error in center field. That allowed the lead off man to reach base. The difference that made was huge. Instead of one out and no one on, Hudson had a runner on first with no outs and the feeling in the pit of his stomach that he knew Bourn should have made that play and didn’t. Errors get in pitchers heads, I don’t care how good they are. Hudson would show some of that frustration when he proceeded to walk the following batter and then hit the one after that. The Giants would follow with 2 sac flies to tie the game. Not a single hit was recorded, yet the Giants were able to tie the game. To make matters worse for the Braves, they continued to allow the Giants to get quick and easy runs. I’m not dismissing the long ball in any way shape or form. However it’s a quick strike attack that doesn’t require any real work. Compare that to a lead off man drawing a walk. Stealing second. Getting bunted over to 3rd. Then scoring on a sac fly. That’s small ball, that’s what I mean by “working” for a run. We didn’t make the Giants do that. They used our own weapon against us. They had home runs by Schierholtz and Fontenot that provided them with a 4-2 lead. All 4 runs were not hard to come by. The other big story was the Braves being able to get runs off Brian Wilson. This isn’t the first time that the Braves had been able to score off Wilson. It was Nate McLouth who drove in a pair of runs against Wilson earlier in the year when the Braves traveled out west. In the post season last year Alex Gonzalez hammered an RBI double off of Wilson. It’s quite apparent that the Braves do not “fear the beard”. Which to me says that the Braves have taken away one of the Giants biggest strengths. If I’m aware of what the Braves have done against Wilson I’m sure he is equally aware and it must be in his head when he takes the mound against Atlanta. So how did the Braves score 3 runs off one of the best closers in the league? Well Constanza started off the inning with an infield single. Once again the team speed of the Braves came through in a big way. Eric Hinske would follow with a good at bat, as he would draw a walk putting two men on with no outs. Now Wilson started to panic a little bit. You could see it in his face that he almost had a “here we go again” type look on his face. Bourn then laid down the sac bunt and moved the runners up to 2nd and 3rd with only 1 out. I liked this play from Fredi for a few reasons. One, I like having 2 runners in scoring position with only 1 out. Two very capable hitters were following Bourn in the order and I liked that Fredi eliminated the double play possibility and put his team in a position where a base hit could tie the game. Second, Bourn handles the bat very well. There was even a chance that he could beat out the bunt if the ball ended up in the right place on the infield. Prado would follow with a clutch hit to score 1 run, Lugo had to be held up at 3rd base. Part of me cringed a little bit because with Wilson you need to score when you have the chance, but at the same time I understand that you can’t risk having a man gunned down at the plate either. McCann would draw a walk, showing good patience at the plate. Uggla despite being red hot was unable to drive in the run from 3rd. Freeman who showed great confidence for a rookie had an awesome at bat. If you guys remember he was down 1-2 in the count. Wilson was only a strike away from ending the game. By Freeman working the count full, he allowed himself to get a pitch to hit. Wilson had to throw a strike, as walking in the tying run was not an option. Freeman took that pitch and drove it up the middle for a base hit which ended the game. An outstanding finish to an outstanding game. Now I have 2 opinions on this game. Why wasn’t Chipper Jones in the line up? This was clearly a big game as you could feel it in the atmosphere, how could he be sitting on the bench? If you remember Chipper was the first and only guy to call out Jason Heyward for not being out on the field when the team needed him most. He said Jason at 80% is better then most guys at 100%. Chipper could have played last night and chose not to. Chipper has been my favorite player since I was 8 years old. I grew up wearing a Chipper Jones jersey to school in Connecticut where there are only Mets and Yankees fans. I love this guy, there is no doubt about it. I think most Braves fans love him, but think about this. If it was anyone else, would you tolerate it? If this was Dan Uggla choosing to not play because he was sore, would that be OK? Or what if it was Prado or Bourn? Does Chipper have the right to sit out whenever he wants? I know he wants another shot to win a ring, that part is obvious but he needs to be on the field more. If this continues then it might have to be his last season, it’s almost not fair to the team. My second thought on this game is that not one person has mentioned Christhian Martinez. I know your giving me a weird look through your computer screen but what a nice job this guy did in the top of the 9th inning. A lot of people thought that game was over, Wilson was coming in with a 2 run lead there was no way the Braves would come back. Martinez could have pitched a sloppy inning assuming the game was over but he didn’t. He showed heart and went out there and put a zero on the board. If he had given up just 1 run then that game could have been tied and going into extra’s where anything could have happened. I give him a lot of credit for keeping us in the game. Other Notes: The Braves are now 4-0 against the Giants this year. With a win against them last night the Braves clinched the season series even if they were to lose the next 3 games. Even if they were to win just one of the next 3 games then they would still finish with a 5-2 record against the Giants which isn’t too shabby. The Braves got away with only using Hudson and Martinez in last nights game. That means none of the big 3 had to pitch last night. A night off for O’Flaherty, Venters and Kimbrel is a very rare thing. This should mean that they will all be fresh and available for tonight’s game. The bullpen might be more readily used tonight as the Braves are throwing rookie Randall Delgado. I say if Delgado can give us 5 solid innings I’ll take it. Today was a very “interesting” day for the Atlanta Braves organization. First off the legendary #6 was inducted into the Braves HOF and had his jersey number retired. After the game had started we realized the surprises were just beginning. In the 5th inning, after giving up back to back homeruns to Freeman and Uggla, Carlos Zambrano intentionally threw two inside fastballs to Chipper Jones. After getting ejected and arguing with fans that were making gestures to him, Zambrano decided to go to the lockers and pack up his stuff. His teammates told media that he had decided to retire. 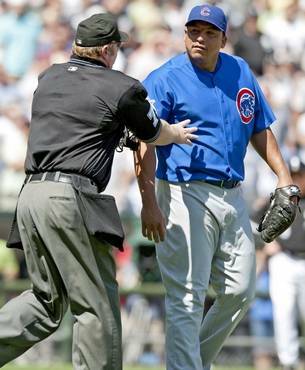 Who knows what will happen with this situation, but all i know is that Zambrano’s career is coming to an end soon. Carlos Zambrano may have thrown his last pitch intentionally at Chipper Jones. 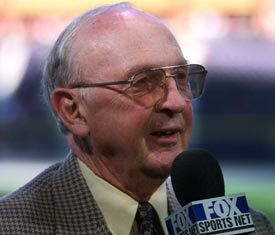 Later in the game, word came in that the great Ernie Johnson Sr. had passed away. This man meant so much to the Atlanta Braves organization and played an enormous role in bringing the Braves to every television in America. The Braves will wear a patch on their uniforms for the rest of this season to commemorate this awesome human being. R.I.P. Ernie……. The Gwinnett Braves played Pawtucket and Coolray field tonight. They lost 5-3 because of a 3 run 9th inning by Pawtucket. Brian McCann started his rehab assignment by serving as the team’s DH. He went 1-3 with an RBI single. He will be catching the game tomorrow, hoping to return to Atlanta’s lineup early next week. Julio Teheran continued to impress scouts with his usual performance. He pitched 7 innings giving up only 2 earned runs and striking out 5. Brandon Hicks also played a large role in tonight’s game going 3-5 at the plate. Tonight the past, present, and future all came together for the Braves and made it a very memorable night.